I have a weird obsession with following other people’s lives. It’s been since I was little and my mom would buy stacks and stacks of trashy tabloids to follow the lives of celebrities. Then as I got older I stalked people via AIM away messages. (remember those!?) Next came Myspace, then Facebook, where you can find out every fact of every moment of your friends and foes’ lives. Eventually, I was introduced to the world of blogging. 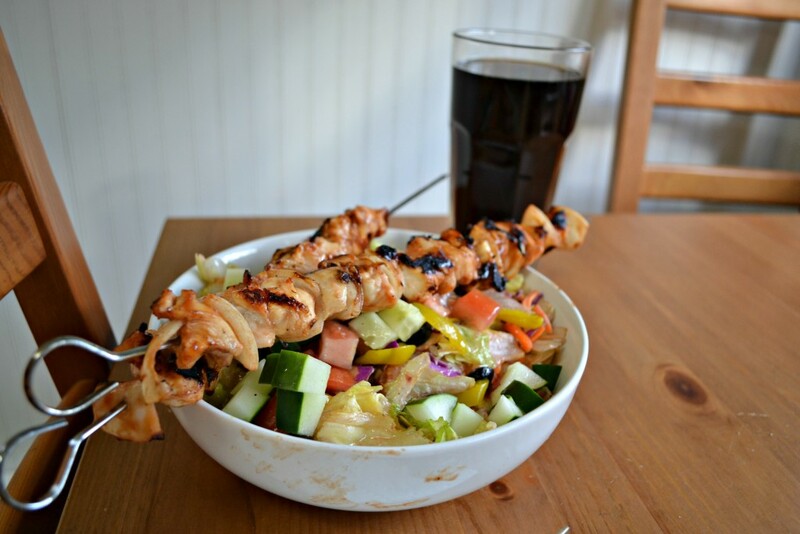 One of my favorite posts to see on my favorite blogging sites is what they ate through a day. So it’s only fair that I share it too! With that in mind, here you go, my own What I Ate Wednesday! Lunch: Eggs, roasted sweet potatoes, steamed carrots, broccoli, peas, and corn, raw tomato and cucumber for Ryan, a “quesadilla” with refried beans, corn, olives, and cut up carrots with a side of homemade salsa for me. Dinner: Poached chicken, steamed veggies, tomato, cucumber, roast sweet potatoes and raw and steamed apples for dessert for Ryan, a huge salad (lettuce mix, tomato, cucumber, olive, banana pepper and homemade strawberry red wine vinegar dressing) and barbecue chicken and onion kabobs and a Coke Zero (life) for me! So there was our day in food! I try to give Ryan a good bit of options with each meal, but as you can see there is a good bit of overlap, since I use a lot of frozen veggies, and steam a ton at one time to use for multiple meals. Today he had his first olives – I know they’re a bit salty, but it considering that he has no other added salt in his diet, and it was 8 slices total, I’m not worried. I make sure water is readily available at all times as well. I’m linking up with Peas and Crayons for What I Ate Wednesday! Have you ever made a random concoction of deliciousness, like I did with my PB&J ‘tostada’? Let me know in the comments! 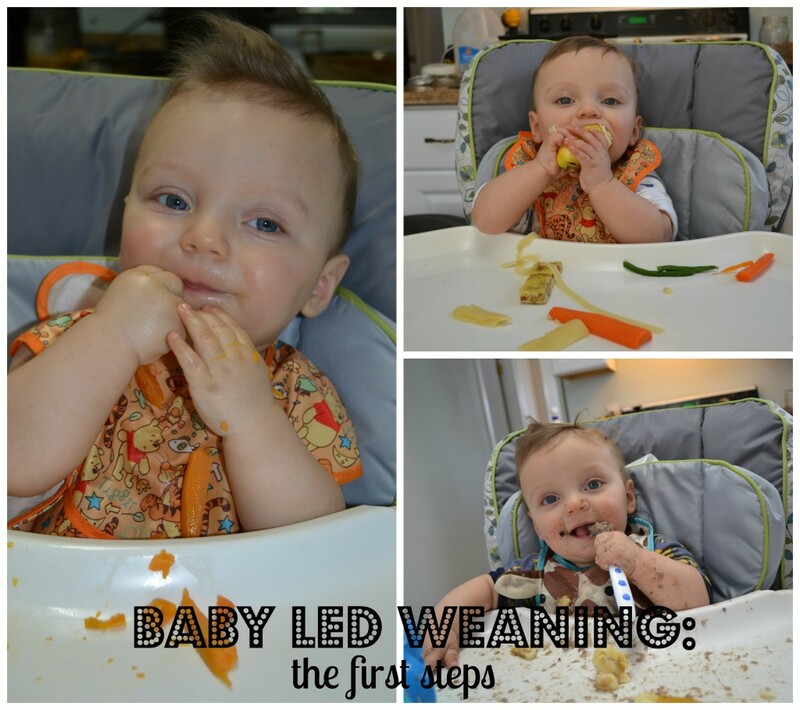 Beginning Baby Led Weaning seemed daunting to me at first, but once we got started it was easy as anything. While there are a few different steps and procedures we went through getting started, it really was simple and fun. 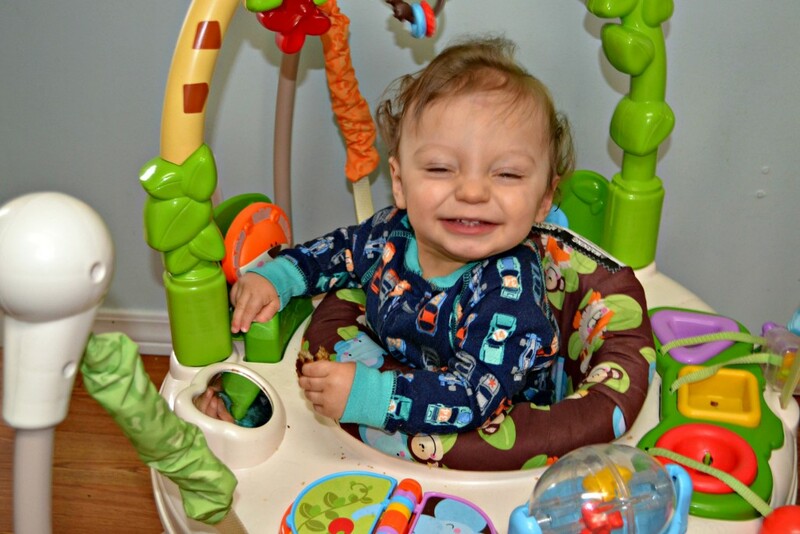 We bought our high chair after Ryan’s pediatrician cleared him to start solids at his 6 month appointment. We knew we needed something that would fit well in our small home, so we chose the Graco Slim Spaces high chair and are really pleased with the decision. The fabric is machine washable, it has a removable tray with two layers, (essentially two stacked trays for lack of a better description.) adjusts to grow with the baby, has an additional pad to support him when he’s smaller, and folds up to fit in small spaces. Essentially, we love it. And in terms of equipment, this the the number one thing you need, and really all you need. I have found that the easiest way to prep foods for baby is using a steamer basket that is expandable and fits in a normal old pot. Chop up the food into sticks that are the length/width of somewhere between your pinky and your ring finger. Put into the steamer basket and cook up until soft. There are a bunch of different ways people test if the food is cooked and soft enough, such as if you can smush it easily between your pointer and thumb. 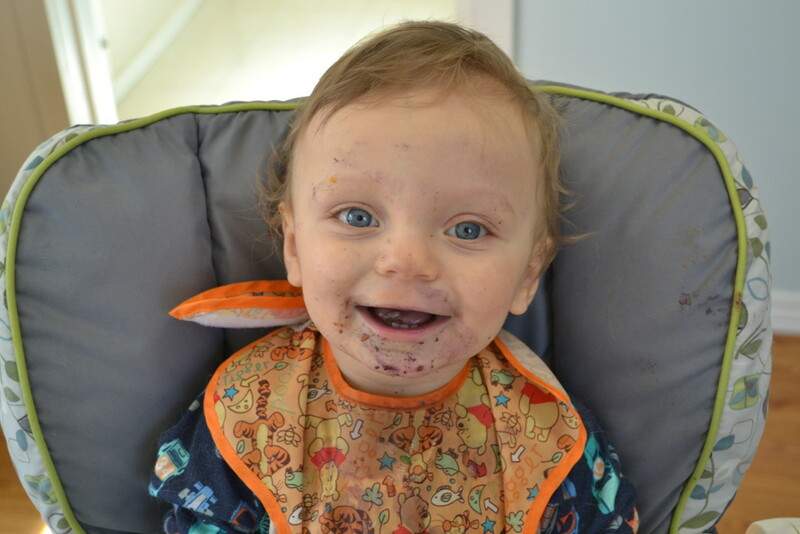 I have found that if (at first – by now, Ryan can eat a lot of different textures) I can begin to smush or crush it when I push a chunk to the roof of my mouth with my tongue, it’s a perfect texture for little gums. 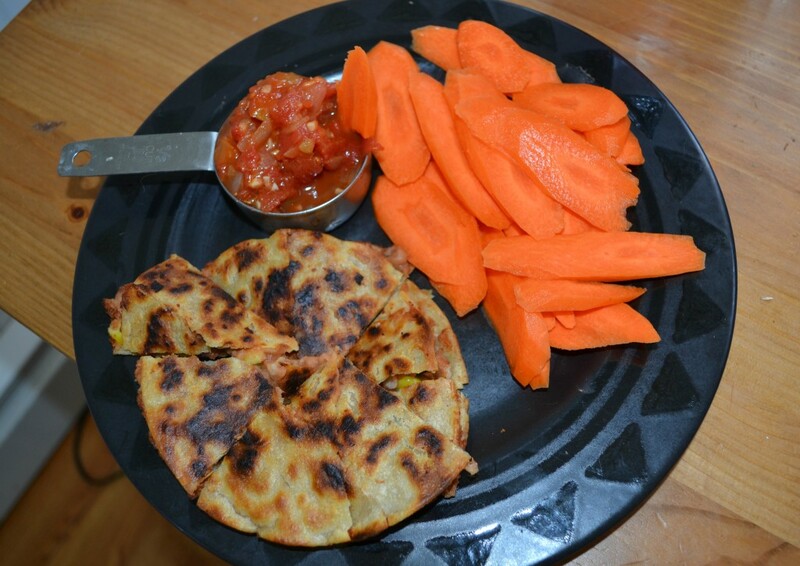 We started with carrots as our first food. 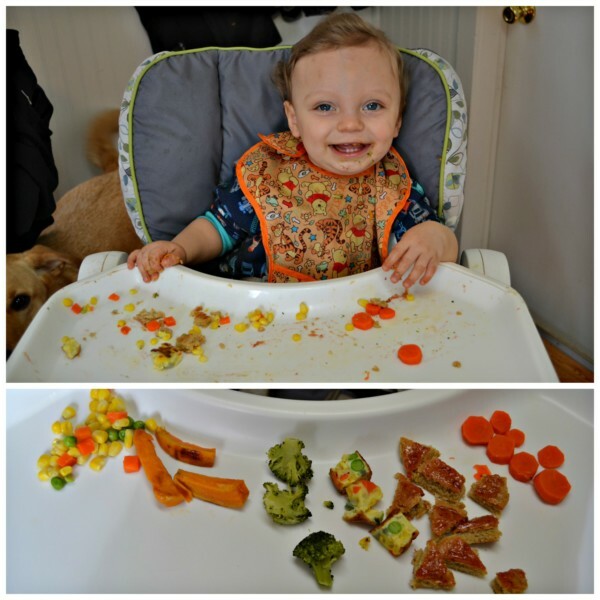 Our pediatrician suggested starting with vegetables, because some babies have a hard time accepting vegetables after they have fruit. (Uhm, I can’t blame them.) As you can see, Ryan was a bit skeptical but he definitely ate and chewed them a bit his first go. At this point, he was shoving everything in his mouth regardless, so I knew the carrot would at least make it that far, but it was fun to see him start to nom it. The first week or two, Ryan would take a bite or two and stop, and a few other times he wouldn’t bother picking up the food at all. On these days, I mixed a both of traditional solids introduction into the mix. 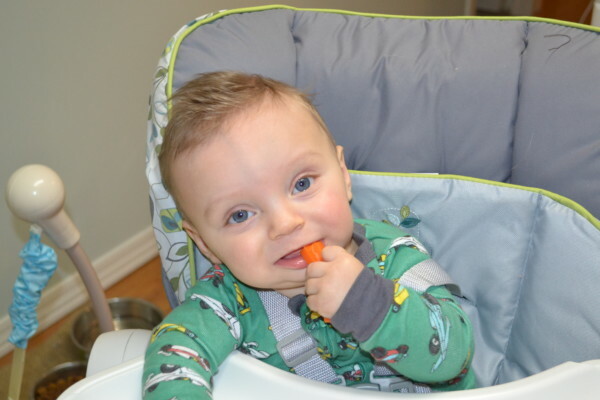 I would smush up the carrot or sweet potato roughly with some breast milk and put it on a spoon and let him taste it that way. Usually at that point, once he tasted the food he would have a renewed interest in the food and grab a stick and go to town, but other times he was more into the mush. When that happened, I took a different approach. We bought these baby spoons made by Gerber. They’re small and long enough for a baby to grab and the ends are great for scraping goo off baby face. I would pre-load three or four of them and hand one to Ryan and lay the others out. With that, he could essentially self-feed with a spoon. I found that I didn’t have to do this past the first few weeks, but it’s a helpful skill he has retained and we now use the same method for things like guacamole and oatmeal. It’s important to note that most sources recommend spacing out the introduction of different foods by three days – that way, if your child has a negative reaction to something, you can easily figure out what it is. We followed this for the first month and a half or so but eventually we dropped the rule, mostly because I forgot. Besides Ryan’s MSPI, there are no food allergies in our family so we were confident with our decision. If there are known allergies in your family, I would definitely consult with your pediatrician on how to handle food allergies moving forward. I think the most important thing to remember is that there is no one plan for how to introduce solids. Do what is right for you, what is right for your lifestyle, what is right for your family. Everyone is different and that is so important to remember, especially as new parents who are confused and just trying to do right by their children. If you follow your gut, you’ll always come out on top. **The links in this post are Amazon Affiliates links. By clicking on them, you will be taken to the Amazon page for that product. If you purchase, I will get a cut of your purchase, but this will not change your price or buying experience. All opinions of these products are my own and are not influenced by anyone other than myself or my family. These restaurants offer dairy free and soy free options, making it perfect for MSPI mommas! Here are the best MSPI friendly restaurants. When I was pregnant with Ryan, Alex and I were living at my MIL’s house to save money for a house of our own. Between wanting to get out just the two of us and my constant cravings we went out to dinner a lot. I would definitely consider ourselves foodies, who love to eat locally and avoid chains. Once Ryan was born, we still wanted to go out, but with Ryan’s allergy it’s a bit difficult. EVERYTHING has soy or milk, it seems, and going somewhere without an allergy menu is like playing Russian Roulette. Did you know that vegetable oil is usually 100% soy oil? I didn’t either, and turns out, a lot of the restaurants I used to frequent didn’t either. So chains it is! Which is good for you, because that means a few of these are probably near you! 1. Chipotle. My favorite. Like, we go there at least once a week. Like, the manager at our local Chipotle knows our names. 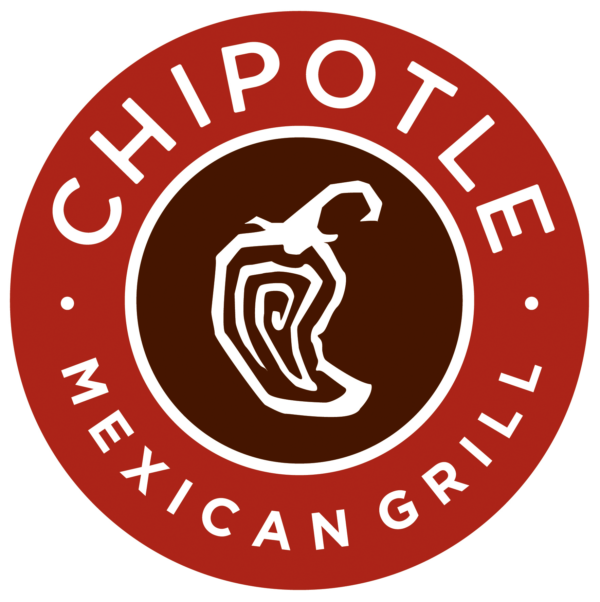 Favorite thing about Chipotle? The only things on the no-no list are flour tortillas, cheese and sour cream. Get a bowl, a salad, or corn tortilla tacos and a bag of chips. My typical order: Carnitas burrito bowl with white rice, black beans. fajita vegetables, mild salsa, corn salsa, and guac. A bag or their lime-y tortilla chips turn it into an awesome dip type meal. 2. 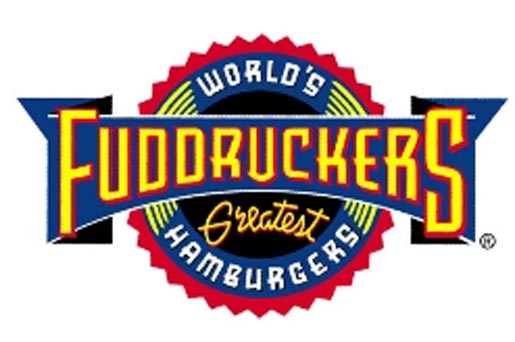 Fuddruckers. While buns and fried food are out of the question, (soy oil) their salads are surprisingly awesome. There are a ton of selections and super open to customization. Plus, the toppings bar makes me happy. Unlimited pickles and banana peppers while a I wait? Yes, please. My typical order: I dig the Bacon and Avocado salad at my local Fudd’s, with added grilled chicken and a substitute of balsamic dressing. 3. Panera Bread. Panera was actually my first job. Its hard to find places that have bread without soy or dairy, and Panera is one of them. Be careful with salad dressing and make sure that you leave cheese off everything. My typical order: In the summer, I’m all about the strawberry poppy seed chicken salad, and the turkey avocado BLT is available all year long and doesn’t need any modifications to be MSPI safe. Chicken noodle soup in a sourdough bread bowl is a great choice when it’s cold. With each meal you get an option of baguette, kettle cooked chips or an apple all of which are MSPI friendly. 4. Five Guys. Oh, Five Guys, let me count the ways I love thee. Okay, so you can’t have a bun here. (though, I have brought my own once or twice!!!!) You CAN have a bunless burger with whatever you want on it and a TON of fries sine they’re done in peanut oil. And really, isn’t it all about the fries? My typical order: Bunless burger with grilled onions, lettuce, tomato and bacon and an order of fries. Tons of ketchup and malt vinegar to make it even better. 5. Cheesecake Factory. This is almost a tease since you obviously can’t enjoy a delicious slice of creamy cheesecake, but it’s a good option. Cheesecake Factory has an AMAZING allergy menu that shows you each item and its allergens as well as how to alter a dish to exclude an allergen. My typical order: Fish and chips without the coleslaw is great, and I love me a good ol’ burger. I’ll keep editing this post as time goes on to include new favorites, but right now this is where we’ve been eating as a family! Do you know of any good allergen friendly spots I should be trying? Let me know in the comments below! When I was in middle school, my way of rebelling my parents divorce and my father’s new girlfriend was to become a vegetarian and make everyone’s lives difficult, because I’m a badass like that. For ten years I subsisted on mostly cheese, yogurt, ice cream and variations of these. My favorite romantic memory of my husband is of a Valentine’s Day when I was in college and he was working night shift. We both came home super late on Tuesday’s and had dinner together, and when i came home that day, the Mechanic had gone to Coldstone early that morning and bought a gallon of my favorite mix to enjoy with homemade whipped cream and tons of sprinkles as dinner. (It’s romantic because he HATES sweets and we’re pretty sure he’s lactose intolerant..) I can be bribed to do almost anything with ice cream, and I have a habit of dipping entire bites of pasta into grated cheese. So you can imagine that when Ryan was diagnosed with a Milk-Soy Protein Intolerance, I was pretty bummed. Two weeks into having a little baby, Ryan started getting super cranky. At this point, I figured that he was out of his super sleepy, quiet newborn phase, so I brushed it off. He was finally gaining weight, and as a first time mom with little-to-no baby experience, I was unsure that his screaming was anything other than normal. But his poops never got yellow, and stayed bright green. He started spitting up literal handfuls of milk that I would catch in an effort to keep the mess in on spot. His screaming jaunts continued, and his diapers started to get stringy and mucus-y. It wasn’t until blood started that I Googled and came to a conclusion – this kid had an allergy. I started with just cutting out milk, and then quickly realized that soy was a problem too, so I cut that out too. Very quickly, he stopped screaming and spitting up, and by his 1 month appointment his diapers were clear. At that same appointment, the doctor confirmed my suspicion. My choices were stop breastfeeding, which was going extremely well, and go on a milk/soy free formula, or keep breastfeeding and continue on a dairy and soy free diet. 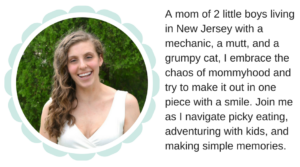 I chose to keep breastfeeding, which I am glad I did. (Though I miss ice cream and cheese and eating out with no complications!!) Knowing my child is getting the best I can give him is worth the inconvenience. 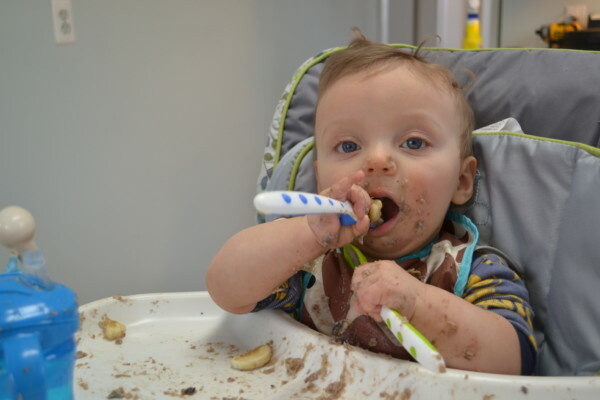 I asked Ryan’s pediatrician at his 4 month appointment when we can start trials – eating some soy or dairy and waiting it out. When you look online, you find everything from 3 months to 18 months. Our doctor told us 1 year. According to him, if we wait out the whole year, avoiding contact with soy and dairy, the chances that he has a long-lasting allergy are greatly reduced. So that’s that! I’ve got at least 8 more months on this diet. I’ve definitely found some work arounds with this diet that I’m planning on sharing. If you have any tips or tricks, please leave them in the comments!